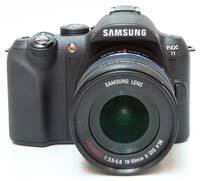 The Samsung NX11 is a new mirror-less compact digital camera with a large image sensor, electronic viewfinder and interchangeable lenses which is intended to bridge the gap between a small compact and large DSLR. A clear rival to the Micro Four Thirds cameras from Olympus and Panasonic, the NX-series is a proprietary rather than open standard, using the NX-mount lens system. The NX11 is a modest upgrade of last year's NX10, with a revised handgrip, new panoramic mode, additional 1:1 and 16:9 ratios, and the incorportaion of i-Function capability, first seen on the NX100. The i-Function button on the new 18-55mm kit lens allows users to control the NX11 by scrolling through manual settings (shutter speed, aperture, EV, WB, and ISO) and using the focus ring to change the parameters for each setting. The NX11 also has a special i-Scene lens priority mode, which automatically selects scene options that are optimized for the lens currently being used. The NX11 has a 14.6 megapixel APS-C sized CMOS sensor, which is physically the same size as those used in entry-level DSLRs and notably larger than the MFT sensor, promising better image quality especially at higher ISO values. Styled like a mini-DSLR, the NX11 incorporates a high-resolution electronic viewfinder with eye-sensor, large 3 inch AMOLED LCD screen, built-in pop-up flash, fast contrast auto-focus system, 720p HD movies and Supersonic Dust Reduction system. The NX11 has a wide range of manual controls plus a Smart Auto function which automatically selects the best shooting mode, while the Smart Range feature captures detail in both the bright and dark areas of the picture. 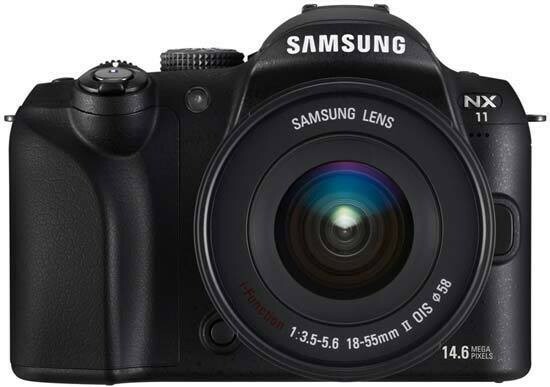 Available in black or silver, the Samsung NX11 retails for £549.99 / $649.99 with the 18-55mm OIS lens. The NX11 is very similar to the older NX10, which is still being sold alongside the newer model. First impressions of the NX11 are very positive, especially considering the aggressive pricing which is cheaper than the NX10 was on launch. Samsung have opted to make the NX11 a mass-market device with an all-plastic body and new 18-55mm kit lens with a plastic mount, rather than taking on the more premium offerings from Olympus and Panasonic (the plastic E-PL2 aside). This is not to say that the NX11 isn't well-built though, and it's certainly a light camera at just over 350g, which you'll appreciate during a long day's shooting. At 123×87×39.8mm, the NX11 isn't that much bigger than the slimline PEN cameras, and is actually a little slimmer and lighter than the comparable G2 / GH2 models - impressive given the larger sensor inside. The depth and weight obviously increase when the supplied poly-carbonate mounted 18-55mm kit lens is fitted, making the NX11 instantly more DSLR-like, but fitting the 30mm pancake lens creates a compact overall package that will particularly suit street photographers looking for an indiscrete camera. The lenses are the main area where the NX11 suffers in comparison to the Micro Four Thirds cameras, especially if you're looking for the smallest overall package. The NX11 is relatively tiny when twinned with the 30mm pancake lens, but the 18-55mm and especially the 50-200mm lens are quite a lot bigger and heavier than their MFT's equivalents. This is completely understandable given the larger sensor that lies at the heart of the NX11, and is the trade-off for the image quality advantages that an APS-C sensor offers. Only you can decide if size and portability or image quality is more important to you. The other downside from a specification point of view are the relatively slow maximum apertures - f/3.5-5.6 for the new 18-55mm lens - but it's still early days for the NX system. The upgraded 18-55mm kit lens features the new i-Function button, an innocuous looking addition to the lens barrel which when pressed activates a sub-menu of key options and allows you to change them simply by turning the focus ring. Consecutive presses of the i-Function button moves through the five available settings - shutter speed and/or aperture, exposure compensation, white balance and ISO. The latter two settings can optionally be turned on or off in the main menu, allowing a degree of user customisation. The i-Function button provides a quick way of accessing certain key settings, and is well suited to the NX11 with its electronic viewfinder where you can hold it up to your eye, press the button and turn the focus ring with your left hand, and grip the camera with your right. Holding the NX11 at arm's length to view the settings while pressing the i-Function button and rotating the focus ring is more cumbersome, especially when you can also use the rear control wheel to perform the same actions, something that I found myself doing by default. Optical image stabilisation is supplied via the lenses, rather than being built-in to the camera body as with the Olympus cameras. It can be turned on and off via the OIS menu option, rather than via a more handy switch on the lens barrel, with two different modes available. When enabled, the NX11 automatically compensates for camera shake, which is a slight blurring of the image that typically occurs at slow shutter speeds when the camera is hand held. In practice I found that it does make a noticeable difference. You don't notice that the camera is actually doing anything different when anti-shake is turned on, just that you can use slower shutter speeds than normal and still take sharp photos. Thankfully leaving the anti-shake system on all the time didn't affect the battery-life too badly. One slight annoyance is the loose action of the AF/MF switch on the 18-55mm lens - on more than one occasion it had been inadvertently moved to a different setting when stored in a shoulder bag. One area where the NX11 really shines is styling and layout. In my opinion this is the best-looking of all the mirror-less cameras, opting for a clean and modern DSLR-like design rather than the retro look of Olympus' PEN series, and which is more curved and "organic" than the Panasonic G-series models. More importantly it also offer a logical and intuitive interface. Samsung's engineering team have firmly hit the nail on the head here, striking a great balance between providing easy access to the main features and achieving an uncluttered control system whilst still managing to cater for both beginner and prosumer alike. Samsung have redesigned the camera's grip, which in comparison to the NX10 is a little chunkier. The NX11 is also better constructed than you'd expect given its relatively small size, light weight and budget price-tag, and is on a par with a lot of entry-level DSLRs. Large metal neck strap eyelets are located on top of the NX11 at the sides, with the rear dominated by the fixed 3 inch LCD screen. The generous, textured black plastic hand-grip is on the left-front of the camera and a thumb-grip on the rear finished in the same rubberised material. When it comes to storing your photographs the GX10 uses SD / SDHC cards, with the memory card slot positioned in the right-hand side of the camera body and protected by a plastic cover, a much better solution than sharing the battery compartment like most cameras do. On the left side of the body is a larger cover that houses four different ports - DC In, HDMI for connecting the NX11 to a HD television or monitor, Remote socket for use with the optional remote shutter release, and AV Out. Having all of these connections in one location makes perfect sense. On the front of the Samsung NX11 is a small focus-assist and self-timer indicator lamp, lens release button, the NX lens mount, rubberised hand-grip, and a handy and un-expected Depth of Field Preview button. Located on the bottom of the camera is the battery compartment protected by a plastic lockable cover. The BP1310 battery provides up to 400 shots under the CIPA testing standard, on a par with the NX11's main rivals. Also found on the bottom of the camera is a metal tripod mount which is commendably located in-line with the centre of the lens mount. 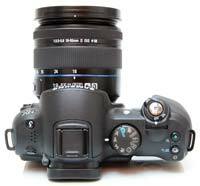 Like the Panasonic G2 and GH2, the NX11 features a built-in electronic viewfinder. The mere mention of an EVF is usually enough to elicit loud groans from any serious photographer, as they have traditionally been poorly implemented in the past, with low-res, grainy displays that were only really suitable for still subjects. Thankfully the electronic viewfinder on the NX11 is much better than most other systems, although not quite as good as the Panasonic cameras. It has a 0.86x magnification and offers 100% field of view, but the resolution is an impressive but lower 921,000 dots and it only operates at 30fps rather than 60fps as on the Panasonic G2 and GH2. The NX11 does have a handy eye sensor underneath the EVF, which switches seamlessly between the LCD screen and the EVF when you hold it up to your eye, saving battery power and removing the unwanted distraction of the LCD display. As the EVF is reading the same signal from the image sensor as the rear LCD screen, it can also display similar information - for example, you can view and operate the Function Menu and see all the current settings, giving quick access to all the key camera settings while it's held up to your eye. The NX11's 3-inch, 614,000-dot rear LCD screen is very impressive, incorporating AMOLED (Active Matrix Organic Light Emitting Diode) technology that provides a number of key advantages over traditional LCD screens. These include easier viewing in bright sunshine and a very wide viewing angle, 10,000 times faster refresh rate than conventional LCDs, less power consumption and a high contrast ratio of 10,000:1. On a less positive note our review sample picked up a few scratches and marks just a few days after arriving in the office, so make sure that you store the NX11 carefully at all times, and it also doesn't offer the flexibility of the G2 / GH2's swiveling LCD screen. The NX11 has a built-in dust-removal system that vibrates the sensor 60,000 times per second to remove any unwanted specks from appearing in your images. By default this feature is turned off, something of an oversight by Samsung, so make sure to enable it so that it works every time you start-up the camera (it only takes about one second). You can also perform a manual sensor clean at any point. The NX11 has a built-in pop-up flash which is activated by a switch on the top of the camera. This useful pop-up unit offers a range of flash synchronisation modes, guide number of 11 at ISO 100, an X-sync speed of 1/180 s / 1/4000 second, and coverage for a 28mm wide lens. The NX11 also offers a flash hotshoe that will accept compatible Samsung flashguns (currently just the SEF-42A and SEF-20A models). Also found on top of the NX11 are the mono mic, burst mode/bracketing/self-timer switch, on/off switch, and tactile shutter button. The small Green button is used in conjunction with other controls to reset them to default values, for example the exposure compensation. There's a traditional round dial with a positive click for the different exposure modes, which is a typical feature of DSLR cameras and enables you to quickly change between the various options. The usual selection of Program, Aperture Priority, Shutter Priority, and Manual are available for the more experienced photographers, and the more beginner-friendly Scene modes and Smart Auto mode are also accessed via this dial. When the new i-Scene shooting mode is selected, the NX100 automatically recognises what type of lens has been attached and suggests a list of scene modes to choose from that are tailored to that specific lens. While this helps to narrow down the usual vast number of choices, it would have been more effective if combined with the Smart Auto shooting mode, rather than being a stand-alone mode, as you still have to pick from the scene modes that are presented to you. Smart Auto is Samsung's equivalent of the intelligent auto modes on competitors from Panasonic (its Lumix range), Sony (the latest T-series Cyber-shots) and Canon (Digital IXUS family). You simply point the NX11 at a scene or subject and the camera hopefully recognizes it from 16 commonly used presets and automatically adjusts its settings to deliver optimum results. This means that it's not necessary for the user to manually delve into scene modes to call up the likes of 'landscape' or 'flower', making the NX11's operation merely a case of point and shoot. In practice the Smart Auto system works very well, with the NX11 usually picking the most appropriate combination of settings for the current situation. Obviously not all situations are covered by the 16 scene modes that the system uses, but it does work for the majority of the time. It makes it possible for the less experienced photographer to easily take well-exposed, sharp pictures of people, scenery and close-ups by simply pointing and shooting the camera and is more intuitive than the traditional scene modes (which are still available). Completing the camera's top-plate is a control dial which is used for, amongst other things, changing the aperture and shutter speed by turning from left to right and back again. As with the shooting mode dial, this is a common feature found on DSLR cameras, so you'll be right at home if you've used a DSLR before - compact camera users will need to become accustomed to using this dial. In Manual mode things are a little trickier. You have to hold down the Exposure Compensation button whilst turning the control dial to be able to change the aperture, which obviously isn't as convenient as having a second control dial as on some DSLRs, but is perhaps understandable given the NX11's target audience. The NX11 can record high-resolution HD 720p 1280x720 movies in the 16:9 aspect ratio and standard VGA 640x480 or 320x260 movies in the 4:3 aspect ratio, all using the H.264 format at 30 frames per second. The Movie mode is accessed by selecting the Movie option on the shooting mode dial and then pressing the shutter button to begin recording. Only Mono sound is recorded during video capture via the small internal mic on the top of of the camera. The HDMI port allows you to connect the NX11 to a high-def TV set, but unfortunately Samsung have decided to cut costs and not include a HDMI cable as standard in the box, which means that you'll have to purchase one separately to take advantage of this camera's HD connectivity. Turning to the rear of the NX11, to the right of the large LCD screen that I've already mentioned is a familiar round navigation pad with four buttons above and two below. Starting at the top are very handily placed buttons for setting exposure compensation and locking the exposure, then the DISP button which cycles through the various display modes on the LCD screen. The fourth button is the useful Fn, which provides quick and easy access to 7 of the most important camera settings, which are presented as a horizontal row of icons in the EVF or LCD screen. Used in combination with the four directions on the navigation pad that set the Focus type, White Balance, ISO and Metering, you really can access most of the NX11's key options with one press of a button, although changing them takes a couple more presses. Completing the rear controls are buttons for playing back and deleting your images, with the latter accessing the Picture Wizard options during shooting. Unlike a conventional DSLR camera which uses a phase detection auto-focus system, the NX11 employs the same Contrast AF system that is commonly used by compact cameras. As with the EVF, experienced photographers will now be tutting loudly at the thought of having to use a traditionally slower system, but thankfully this decision hasn't resulted in a slow and unpredictable AF - quite the contrary in fact. 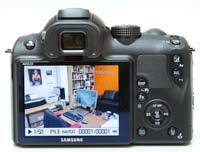 The Samsung NX11's focusing speed is on a par with the Panasonic G1 / GH1 cameras and most DSLRs. This means that it is noticeably quicker to lock onto the subject than some Olympus PEN cameras which crucially suffer from a 1/2 second lag. There were also very few occasions when the NX11 failed to lock onto the subject, especially when using the centre AF point, which can be usefully set to one of four different sizes. There are four AF Area modes on offer, including Selection AF with a selectable focus area, Multi AF, Face Detection, and Self-Portrait Tracking, with Single, Continuous and Manual AF Modes available. The NX11 also has a useful AF Priority function that begins focusing as soon as you point the camera. Manual focusing is assisted by the 'enlarged display' function. Once you have selected manual focus mode on the lens barrel, turning the manual focus ring automatically increases the magnification on the LCD display, which is a big help in getting the focus spot on. This is real, non-interpolated magnification, very useful for accurate manual focusing - provided you find a way to steady the camera. The screen cleverly returns to normal magnification when you stop using the manual focus ring for a few seconds. Metering options include Multi, Center-weighted and Spot, while the ISO range runs from 100-3200. There are 6 white balance presets plus Auto and Custom settings and the ability to set a precise Kelvin value, and if you can't make up your mind the white balance, exposure and even the Picture Wizard settings can all be bracketed. You can shoot movies using the Program or Aperture-priority modes, giving you some control over exposure, and you can also change the aperture during recording, albeit at the expense of recording the mechanism on the soundtrack. The NX11 offers the ability to use any of the 9 Picture Wizard settings during video recording as well as still images, which instantly lends an interesting art-house effect to your home movies, the self-timer can be used, and the Wind-cut function reduces the unwanted intrusion of wind noise. 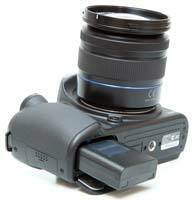 You can use a zoom lens during recording with focusing set as for still images by half-pressing the shutter button. On the negative side, you'll find that if you choose continuous auto-focus, areas of the video will be blurred before becoming sharp again as the camera tries to refocus and the noise of the AF system is a little intrusive. Using manual focus is trickier but will ultimately produce better looking and sounding movies. On a more positive note, having the AF system is better than not being able to auto-focus at all, as with all current DSLR cameras that offer video recording. Hand-holding the NX11 during movie recording inevitably leads to obvious shake, so for best results you'll need a dedicated video tripod. The main menu system on the NX11 is very straight-forward to use and is accessed by pressing the Menu button to the left of the EVF. There are seven main menus presented as a row of horizontal icons, much like Canon's DSLR camera range. As mentioned previously, the Fn button speeds up access to some of the more commonly used options. Due to the large LCD screen and restricting the number of on-screen choices to six, the various options and icons are clear and legible. If you have never used a digital camera before, or you're upgrading from a more basic model, reading the easy-to-follow manual before you start is a good idea. Unfortunately Samsung have chosen not to supply it in printed format, so you can't carry it with you for easy reference. The start-up time from turning the NX11 on to being ready to take a photo is impressively quick at around 1 second, and as I've already mentioned the Contrast Auto-Focusing system is as fast as most DSLRs. The NX11 usually achieves focus most of the time with any of the three lenses available on launch, helped by the AF assist lamp - the NX11 doesn't have any notable problems locking onto the subject in low-light situations. It takes about 1 second to store a JPEG image, allowing you to keep shooting as they are being recorded onto the memory card, with a brief LCD blackout between each image. Storing a single RAW image takes around 4 seconds, but thankfully it doesn't lock up the camera in any way - you can use the menu system or shoot another image while the first file is being written to memory. The Samsung NX11 has quite a good Burst mode which enables you to take 3 frames per second for an unlimited number of JPEG images at the highest image quality, or 5 RAW images. The interesting Burst modes shoots at 30fps for 30 shots with a single press of the shutter button, but only for 1.4 megapixel JPEGs. Once you have captured a photo the Samsung NX11 has a fairly good range of options when it comes to playing, reviewing and managing your images. You can instantly scroll through the images that you have taken, view thumbnails (up to 20 onscreen at the same time), zoom in and out up to 7.2x magnification, view slideshows, delete and protect an image and set the print order. The Image Edit option offers a number of different ways to alter the look of an already-captured photo, including redeye fix, backlight, changing the photo style, resizing, rotating and face retouch. The Info button toggles detailed settings information about each picture on and off, such as the ISO rating and aperture / shutter speed, there are small brightness and RGB histograms available, and the Highlight option makes any blown-out highlights areas flash on the LCD screen.